Toby arrived on New Years Eve. He was found shivering in a snow bank where somebody had dumped him, obviously a Christmas present who had worn out his welcome. 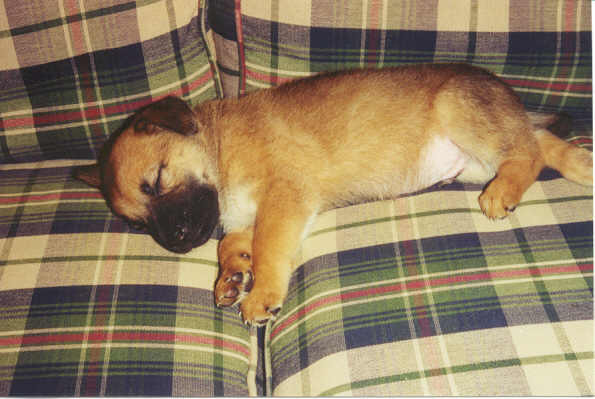 He was a shepherd-chow mix, 5 to 6 weeks old. At first, he slept a lot and ate puppy food that had been soaked in water until it was soft. He grew quickly. He was cute, probably the cutest puppy we've ever had. Lots of people wanted Toby. 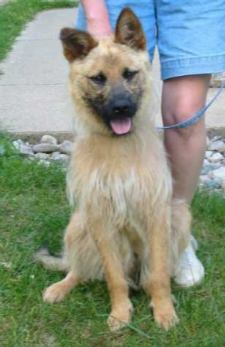 He left in early February for a great home in Sturgis. 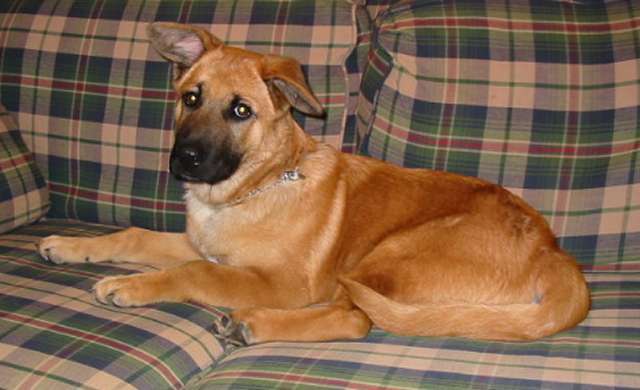 Here's a couple of Toby (now Tucker) photos in his new home, taken in May 2003: Tucker 1 and Tucker 2. In August we paid him and his great new mom and dad a visit. He's just beautiful and as happy as a dog can be. August picture here. Next up was Sara. She had led 2 years of a hard life. Starved and having had no medical treatment, she was a mess, found with heartworm, raging ear infections and trying to feed eight pups. Such is a dogs life in a drug dealers house. Amazingly, she was a sweet dog, loving, gentle and undemanding. She has learned what treats are and how much fun it is to play. We really enjoyed fostering Sara. Mickey and Molly are brother and sister. Their mother was involved in a car accident and broke her pelvis. She was in no mood to feed seven puppies. 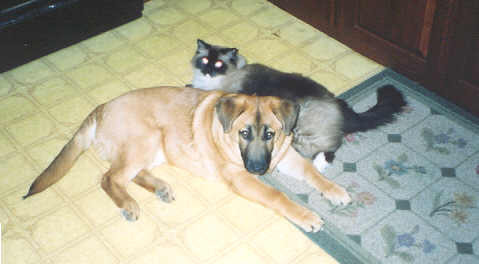 We took these two in March 2003 when they were four and one-half weeks old. My gosh they both have lots of energy. Cute pups, though. To see a comparison of Rufus and Molly click here. They went off together to live on a farm. They stopped by to see us when they have reached 6 months. Here are photos we took of Mickey and Molly (now called Mallory). A week after Sara left, Max arrived. He was dropped off in the country north of Plainwell. 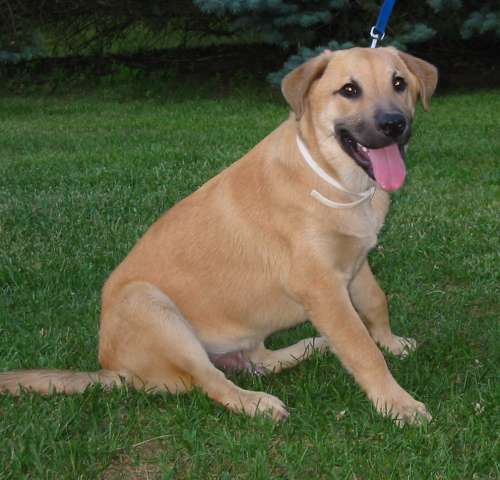 He's a 3 or 4 month old shepherd-retriever mix, very well-behaved and loving. 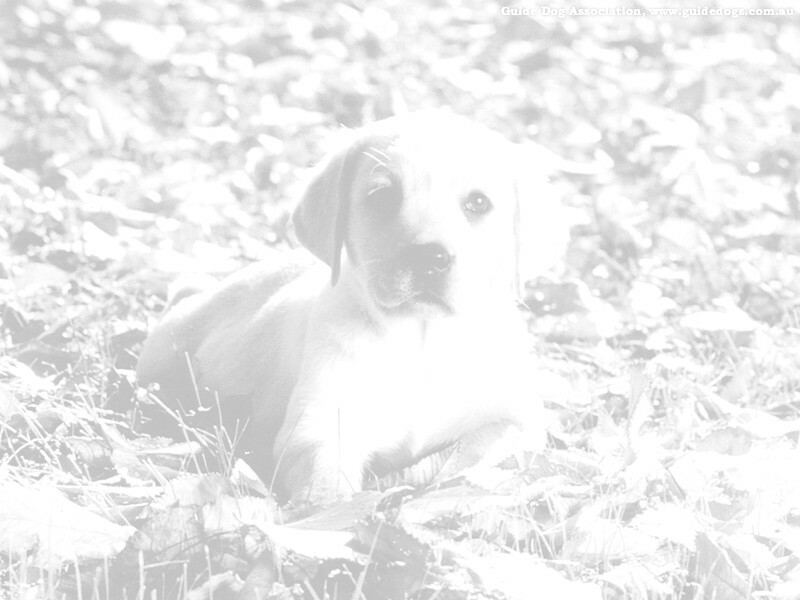 He always tried to catch your eye with his soulful big brown eyes. He loved to play, a real bundle of energy. 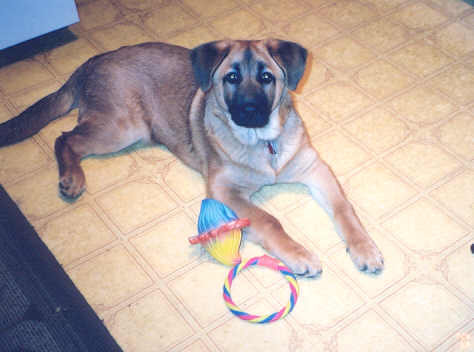 Max was a really super pup that found a great family in the Pine Lake area during May 2003. We heard that two dogs had been dropped off in the Martin Area. 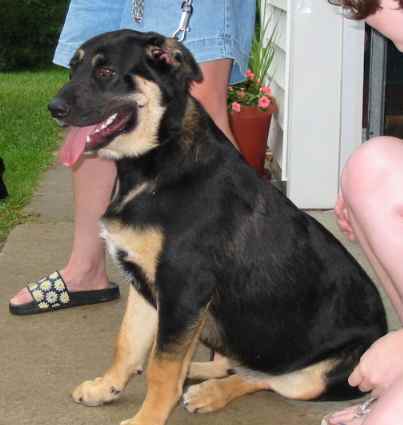 We took in one, a German shepherd mix, and named him Jack. 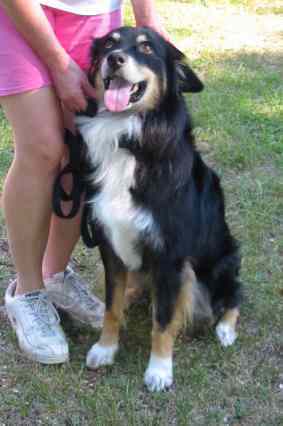 Jack was a beautiful pup - shiny black and copper brown coat. He was in perfect health and so well behaved. It's hard to imagine how anyone could give this guy up. 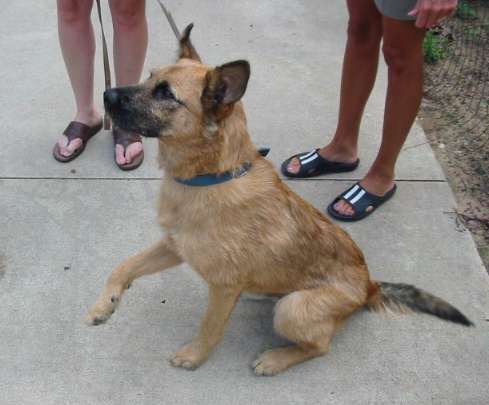 He also found a great home in the Pine Lake area, in early June 2003. Jack had only been gone a couple of days when Nemo was found and ended up with us. He was a stray with ribs showing and full of fleas. We had no idea what mix he was and his coat looked awful (some people think he looks cute) but he is a friendly boy just needing a good home. A family from Sturgis fell in love with him and off he went. 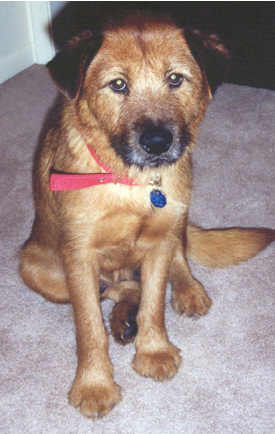 We visited Nemo, now called Baxter, and his new family in August 2003. He looks great and he lives with a Jack Russell terrier. They are the best of friends. August picture here. Way to go Nemo! We didn't have a dog for a couple of weeks until this boy was found by somebody in Kalamazoo. 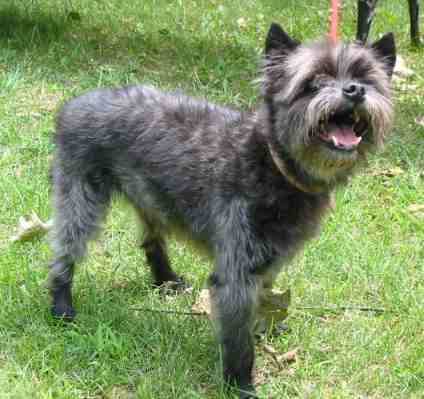 He is a Cairn Terrier mix, pretty old we thought. A very nice dog. He loved to sit in your lap, ride in the car and was very well behaved. Turned out that his name was Chiclet. He was reunited with his family a couple of days after he arrived. A week after Chiclet left, Copper arrived. 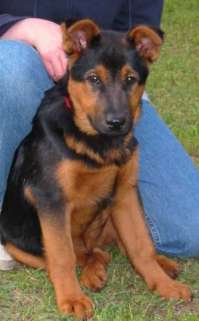 He was a 4 month shepherd-retriever mix whose owner had fallen upon hard times and had to give him up. 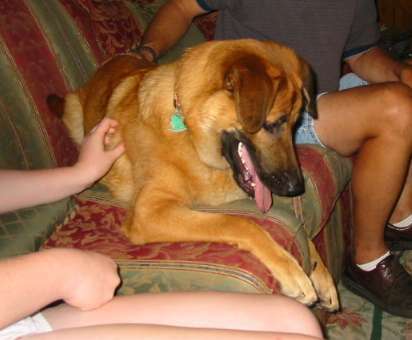 Not only was Copper a beautiful dog but he was friendly, house-trained and knew basic commands. 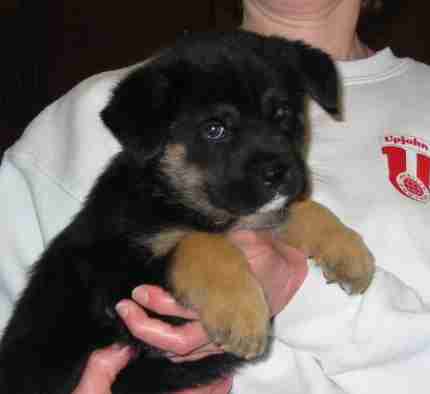 He was a delightful puppy to have in the house. 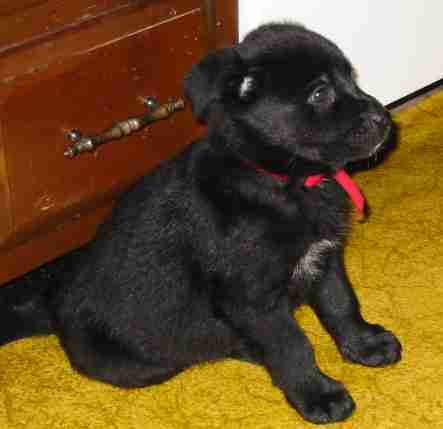 He went to family who live on a lake and already had a beautiful black 1 year old lab pup for Copper to play with. In September of 2003 Cody arrived. He was a Aussie/Sheltie/border collie type mix, about 2 years old and was found wandering around a neighborhood eating from dumpsters. 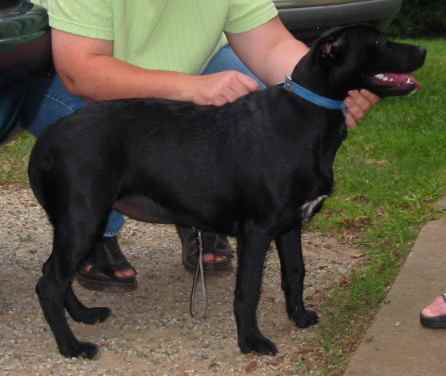 He was very thin and came with heartworm plus a wound on his face. At first he thought he had been shot but according to the vet it was an abscess caused by a tooth. Cody was very loving and loyal. He left us for a great home in Holland in late December. And that was it for 2003!